Richard Alfaro’s winery is barely over ten years old, but he and his wife, Mary Kay, have had a personal interest in wine for well over twenty-five years. Richard is a long time wine collector, a Cabernet Sauvignon and Bordeaux aficionado originally, and Mary Kay is a certified sommelier. Richard’s success as a baker allowed him to pursue his wine passion. He founded Alfaro’s Micro-Bakery in Watsonville in 1988 and was one of the first in California to produce quality speciality breads which have now become commonplace at markets. In 1998 he sold the bakery to Sarah Lee who were eager to acquire his recipes. This gave him the funds to acquire a 75-acre apple farm at the southern tip of the Santa Cruz Mountains appellation in Corralitos. Richard had his Pinot Noir epiphany in 1996 when he drank a 1994 Rex Hill Reserve Willamette Valley Pinot Noir at a restaurant in Lake Tahoe. He was taken by the wine and returned to the same restaurant the next evening to confirm his impressions. He ordered another bottle of the same wine and it was even better the second time around. Today, Alfaro Family Vineyards has one of the largest plantings of Pinot Noir in the Santa Cruz Mountains. Lindsay Paige Vineyard is named after the Alfaros’ daughter. Planted in 1998, the 7-acre vineyard has both Chardonnay and Pinot Noir on a south-facing hillside at elevations between 500 and 650 feet. The high density planting of Pinot Noir (almost 2,000 vines per acre) consists of multiple clones including Dijon 113, 114, 115, 667, 777, and 828, and Pommard 4 and 5. The Alfaro Family Vineyard is the largest vineyard at just over 16 acres and is planted only to Dijon Pinot Noir clones 113, 114, 115, 667, 777, and 828 (1,361 vines per acre). Ryan Spencer Vineyard, named after the Alfaro’s son, was planted in 2001. This vineyard is composed of 7 acres broken into 6 different blocks with Pinot Noir (Pommard 4 and 5), Chardonnay, Merlot, and Syrah planted. Mary Katherine Vineyard is at the summit of the property, between 700 and 850 feet in elevation on a steep terrace. Own-rooted vines were planted in 2008 with cuttings selected from a Grand Cru Vosne- Romanee monopole vineyard. The Robert Young clone of Chardonnay makes up the remainder of the plantings here. This vineyard is named after Richard’s spouse to whom he has been married to for 26 years. The Alfaro wines are full-bodied, well-endowed and moderately tannic and will appeal to those with a love of rich and luscious Pinot Noirs. They can stand up to hearty food such as short ribs. The wines are improving with each vintage as Richard’s vines become more mature and he becomes more adapt at working with the estate fruit. 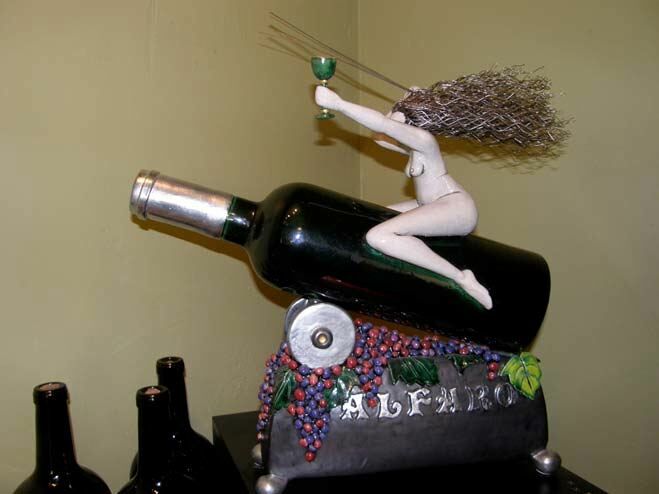 Alfaro previously had a second label with a winemaker partner (Martin Alfaro Wines), but this line of wines has been discontinued. Bottled a few months ago, unreleased. 10 clones. Aged 20 months in 70% new French oak barrels. · Quite approachable and charming now featuring a crisp core of red cherries and berries with an accent of oak spice. Well-structured with healthy tannins and built for the long haul. Very good. 14.5% alc., pH 3.73, 807 cases, $25. 80% sourced from the three estate vineyards (yields 1.5 tons per acre). 50% whole berry fermentation. Aged 16 months in 40% new French oak. A popular restaurant by-the-glass wine. Released April 1, 2009. · Appealing nose of darker fruits, particularly spiced plums. Rich and full-bodied with a deft touch of oak. Nicely balanced with modest tannins and bright acidity. Ready to go and a very good wine for the tab. 14.5% alc., pH 3.59, 256 cases, $35. 100% de-stemmed, 5-day cold soak, whole berry, indigenous fermentation. Aged 15 months in 66% new French oak. Unfined and unfiltered. · A shy but sophisticated nose of hi-tone black cherry and black raspberry fruit with a slight smoky edge. Opens beautifully over time. Tasty, rich black raspberry fruit in a husky style with moderate ripe, dry tannins leading to a lingering and sappy finish. I would cellar this for another year. Very good. $18. 95% Pinot Noir composed of left over lots. · An easy drinker that is light in weight with tasty cherry fruit and a very dry finish. Decent. 14.2% alc., pH 3.65, 200 cases, $40. Released September 1, 2008. 100% de-stemmed and lightly crushed. 7-day cold soak. Aged 16 months on the lees in 70% new French oak. · Aromas of cherries, vanillin and a hint of oak. Medium-weighted core of cherries and cranberries with a hint of red apple. Juicy and crisp with moderate tannins which could use some more time to soften. Decent (+). 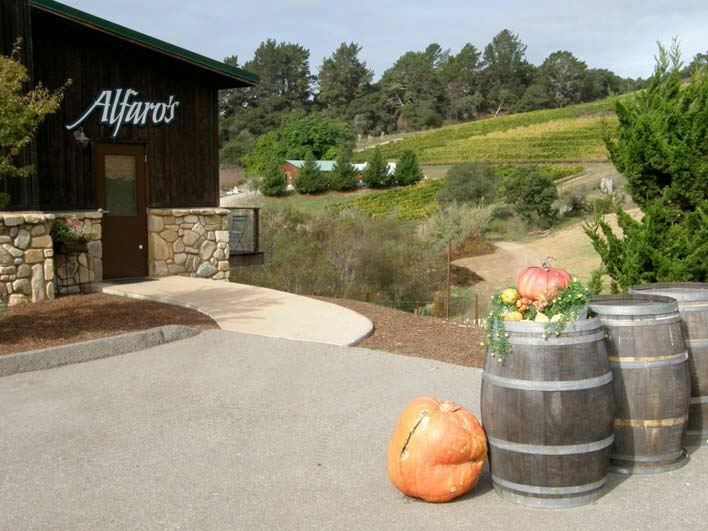 Alfaro Family Vineyards & Winery is open on Saturdays from 12:00 to 5:00 at 420 Hames Road in Corralitos. A new tasting room welcomes visitors to a relaxing deck to picnic outdoors and view the vineyard. You will feel very much at home if Richard or Mary Kay are holding court at the tasting bar to receive you. The wines (including Chardonnay, Merlot and Syrah) are available by phoning 831-728-5172. Visit the website at www.alfarowine.com. Wine club members receive a 20% discount on wine purchases.